Plastic and reconstructive surgical team, Interplast Australia & New Zealand will visit Mt Hagen Hospital from 13th – 22nd February 2018 to conduct surgical operations on patients with external body disabilities. The team of volunteer doctors and nurses will meet their own return airfares to Mt Hagen to provide free surgical intervention programs to relieve people of disabilities such as cleft lip and palate, burns, tumours, hand injuries and contractures. The team of six medical professionals which includes two plastic surgeons, two anaesthetists and two registered nurses will be led by Dr Mark Strahan. Besides carrying out surgical operations, the team will also provide mentoring and training for local medical staff. The team will conduct a consultation or review clinic on Tuesday, 13th February at 9am at the Consultation Clinic where all patients are required to attend before actual surgical operations commence the next day. Interplast Australia & New Zealand has been sending teams to Papua New Guinea every year since 1985 to provide free surgical intervention programs and Mt Hagen Hospital has been included on many of these visits in the past few years. This year’s visit is the 111th by Interplast teams and they have so far conducted more than 2,800 life-changing procedures in the country. The Western Highlands Provincial Health Authority is happy to have the team back in Mt Hagen again this year and has welcomed and thanked it for providing a much needed service free of charge. Acting Chief Executive Officer, Mr David Vorst said nearly all patients were people who lived in villages and it demonstrated WHPHA’s efforts to ensure everybody had access to this important service. When the team visited Mt Hagen early last year, it saw more than 100 patients and successfully operated on about 30 patients who have now been given a new lease of life. 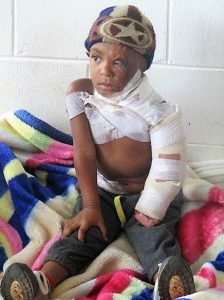 A little boy who had been operated on last year after falling into a fire and having his left side of the body from the head down burnt severely.